1940 - 1949 - Brighton technical school, Victoria, Australia. ​The Age, Thursday, 8 February, 1940. Page 10. Eagerness on the part of young Victorians to acquire technical training has resulted in a rush of students to enrol at technical schools to such an extent that the Government finds it difficult to keep pace with the demand for accommodation. Although figures of the number of students enrolling for the junior technical schools will not be available until next week, when reports from the head masters are received, the secretary of the department, Mr. Graham, said yesterday that undoubtedly there would be an increase as compared with last year. That was the present tendency. In the last three years the numbers of such students had grown by more than 60 per cent. Since the present Government had come into office, particular attention had been paid to technical education, both in the matter of staffing schools with qualified teachers, and also in providing accommodation. The cost ran into many thousands of pounds, and each year large sums were being applied to that purpose. Mr. Graham pointed out that in the last three years new technical schools had been provided at Essendon, (replacing the old school at West Melbourne), Sunshine, Preston, (for girls), Box Hill, (for girls), and others are being considered. Extensive additions have been made at the Melbourne Technical School, Footscray, Brunswick, Brighton, Prahran, Ballarat, Bairnsdale, Yallourn, Echuca, Warrnambool, Geelong and Stawell schools. Accommodation had also been provided for special training for trainees for the R.A.A.F. This work, which was being paid for by the Commonwealth Government, was being carried out under the supervision of the chief Inspector of Technical Schools, Mr. Eltham. ​The Age, Tuesday, 25 June, 1940. Page 10. After considerable discussion, during which the State Government was criticised for alleged neglect to install modern workshop machinery in technical schools, the Brighton council last night voted £250 for the purchase of a lathe for the Brighton Technical School. A letter was read from the head master, (Mr. I. Topperwien), stating that the plant for the training of apprentices for munition work, especially the lathes and cutting tools, was hopelessly obsolete. Cr. Tracey said the State Government was not doing its job in adequately equipping the school. It was decided to ask the Government to also vote £250 for equipment. ​The Age, Thursday, 12 December, 1940. Page 6. The Director of Education, (Mr. J. A. Seitz), in opening the recently completed extensions to Brighton Technical School last night, referred to the rapidly growing importance of technical education as a factor in the welfare of the State, particularly in regard to the national war effort. Mr. Seitz, who was received by a guard of honor provided by the school cadets, was welcomed by the mayor of Brighton, (Cr. D. Granter), and the president of the school council, (Mr. J. Entwisle). The additions to the school include chemistry and modelling rooms for the boys’ school and a science room and a classroom for the girls’ school. The new rooms are all equipped on modern lines, and involved an expenditure of about £4000. They will not increase the accommodation at the school for the reception of more students. The school has an enrolment of 1500 students and an average daily attendance of 1300. The additions will materially assist to relieve overcrowding in the departments affected, but generally the need for more accommodation still exists. A display of students’ work was organised by the principal, (Mr. I. Topperwien). It included exhibits from both the junior and senior schools, and was representative of the wide range of arts and crafts taught in the various classes. The girls’ school had on view examples of cookery, including jams, pickles and preserves; and millinery and dress making. In the science room a special exhibit illustrated a course of diatetics and house-craft chemistry. From the boys’ school were working meccano sets and various modern mechanical devices, lead, sheet metal and copper work. Other features of the display were all forms of Commercial art, drawing, painting, model of farms, including sheep, horses and cattle, and ore treatment works. ​Australasian, Saturday, 11 January, 1941. Page 40. “It is doubtless true that education has progressed, but there are still many people in the community who have very strange ideas in relation to it. Far too many parents, for instance, look upon a secondary school as a place where their boy may be taught to earn a living wearing his collar and tie, and certainly not removing his coat. It is strange that this mistaken notion should persist in a country which is so fundamentally democratic in other ways. ​The Argus, Saturday, 18 January, 1941. Page 5. ACTING SERGEANT LAWRENCE ELIOT WEST (wounded), is an only son and was for three years attached to the Field Artillery in the Militia before joining the A.I.F. He sailed for abroad last January. Educated at Brighton Technical School, he was a salesman in P. Falk and Co. Ltd. before enlisting. He had his 23rd. birthday this month. The Age, Saturday, 15 February, 1941. Page 24. Brighton Technical School’s annual carnival was held at Middle Brighton baths yesterday. The competing houses were Wilson (W.), Grout (G.), Snowball (S.), Richards (R.). G. Newman (W.), 1; A. Stott (R.), 2; W. Bennett (S.), 3. P. Heighway (W.), 1; A. Baxter (G.), 2; J. Hutchinson (R.), 3. G. Packham (W.), 1; J. Worrell (G.), 2; J. Underwood (S.), 3. R. McLaren (S.), 1; J. McGrath (G.), 2; H. Keane (G.), 3. G. Newman (W.), 1; J. Lloyd (W.), 2; R. Stanley (R.), 3. R. McLaren (S.), 1; R. Venner (W.), 2; M. Kent (-), 3. A. Purves (G.), 1; B. Bowman, (W.), 2; G. Newman (W.), 3. K. Barr (S.), 1; R. Burke (R.) 2; N. Byrne (R.), 3. J. Hutchinson (R), 1; A. Baxter (G.), 2; W. Hanlon (R.), 3. R. Byrne (G.), 1; R. McLaren (-), 2; G. Packham (W.), 3. The Argus, Saturday, 29 March, 1941. Page 9. Roars of applause from the enthusiastic crowds greeted each decorated float in the Queen Carnival procession through the city streets yesterday. Leading the procession was the Red Cross float, on which Miss Elsa Stenning wearing a white robe and long red cloak and bending protectingly over a small child, symbolised the spirit of the Red Cross. This was followed by the Australian Comforts Fund float, on which the emblem of the fund was carried out in red, white and blue. Uniformed workers stood at each corner. Marching units interspersed throughout the procession included the Red Cross transport drivers, Brighton Technical School Cadet Corps, Australian Women’s Legion, Sea Scouts, Police Trainees, Melbourne Militors, and members of sporting organizations. Mounted police and a group of 25 women riders also took part in the parade. ……………………………………………. ​The Age, Monday, 5 May, 1941. Page 8. Organised by Brighton Municipal Band, an A.R.P. demonstration at Elsternwick Park yesterday attracted what is estimated to be the largest gathering yet seen in that enclosure. The attendance was officially set down at more than 25,000. Prior to the demonstration a massed bands march from Elsternwick station to the park was held, in which Brighton Municipal, Footscray City, Moorabbin City Junior, Caulfield City Junior, Coburg Central and Coburg Ladies’ Pipe bands took part. A spectacular feature of the display was a march past by members of Brighton V.A.D., Brighton Red Cross emergency service, Australian Women’s League, Brighton A.R.P., personnel, the local volunteer defence corps. Australian Air League, district boy scouts and cadets from Brighton Grammar School and Brighton Technical School. Members of the Metropolitan Fire Brigade gave a demonstration of the method of handling incendiary bombs and of the use of asbestos suits for entering blazing premises in air raid rescue work. A collection in aid of Brighton patriotic fund yielded about £155. A.R.P. Air Raid Precautions (A.R.P.) were organised by the national government and delivered by the local authorities. The aim was to protect civilians from the danger of air-raids. ​The Age, Thursday, 8 May, 1941. Page 10. A deputation, introduced by Mr. Field, M.L.A., waited on the Minister of Education, (Sir John Harris), yesterday with a request for a technical school at Cheltenham. Representatives of Sandringham, Mordialloc and Moorabbin municipalities attended, as well as representatives of district school committees and mothers’ clubs. It was urged that technical educational facilities were needed in the district, the nearest schools now in existence being at Caulfield and Brighton, both filled to capacity. Cheltenham was considered an ideal site for the Bayside centres, and there was plenty of Crown land available. The big area of the State school ground, surrounded by parks, could be used, and thus no capital expenditure on site would be involved. The Minister said three factors governed the erection of technical schools. The department wished to keep a balance between technical careers and “white collar” training; technical schools cost more, and upkeep was higher than high schools, and the Government would not construct schools unless provided with sites that would allow for future expansion. He received requests from Dandenong, Sandringham and Oakleigh for a technical school. Apparently a school was needed to serve the south-eastern district. He had asked the Director, (Mr. Seitz), and the Chief Inspector of Technical Schools, (Mr. Eltham), to make a survey of the technical educational requirements in the whole of the metropolitan area. ​The Age, Wednesday, 14 May, 1941. Page 6. The first hockey competition for technical schools will be inaugurated by the Victorian Hockey Association on June 4. Entries have been received from Brighton, Preston, Swinburne, Footscray, Essendon and Collingwood technical schools, and in each case one of the clubs in the association will look after the team. Matches will be played on Wednesday. This is the only new competition which the association is establishing this year. ​The Age, Friday, 16 May, 1941. Page 8. FUNERAL OF MR. F. I. HINRICHSEN. The funeral of Mr. Frederick Isaac Hinrichsen, Wright-street, North Brighton, whose death occurred on Tuesday, took place at Brighton cemetery yesterday, following a service conducted by Rev. Dr. Atkinson, of New-street Methodist Church. Mr. Hinrichsen was a Past Grand Master and trustee of the G.U.O.O.F., past secretary of Brighton Union of the I.O.O.F., foundation member and secretary for 26 years of the Baptist Friendly Societies’ Dispensary, a foundation member of Brighton Technical School committee. He took an active interest in the New-street Methodist Church, of which he was a trustee, and was superintendent of the Sunday school for 30 years. He acted from time to time as election secretary for many politicians, including Sir Thomas Bent, Mr. O. R. Snowball, Mr. Agar Wynne, and Sir H. Gullett. Arrangements were carried out by Austral Funeral Services Pty. Ltd.
​The Age, Tuesday, 3 June, 1941. Page 8. Private Alan (Doon) Knights, 25 years, reported missing in Libya since May 3, was born at Yea. He is the youngest son of Mr. and Mrs. C. J. Knights of North Brighton. He attended Sandringham State and Brighton Technical Schools, and played Association football with Brighton and Sandringham teams. He is the youngest of a family of eleven. He has a brother, (Doug), serving with the A.I.F. abroad. He enlisted last June, and sailed in November. The Age, Tuesday, 8 July, 1941. Page 6. THE A.I.F. ROLL OF HONOR. Pte. E. Swansson, 21 (wounded in action), is the only son of Mr. and Mrs. Swansson, Charles-street, St. Kilda. Born in Kerang, he was educated at Brighton-road State School and Brighton Technical School, and was a leading Rugby player for St. Kilda. His father is an Anzac who fought in the World War. The Age, Wednesday, 3 December, 1941. Page 9. A comprehensive display of work by students of Brighton Technical School, (Mr. I. Topperwien, principal), was opened at the school last night by the mayor, (Cr. R. T. Breen). Exhibits included excellent examples of commercial art, etching, sheet metal work by the junior school, models of important industries, maps, drawings, plans by social studies students and woodwork. A particularly attractive section was the display of millinery and dress making by girls attending the school. In the science group were some fine models of modern aircraft. ​The Argus, Friday, 19 December, 1941. Page 8. The following students are recommended for the following scholarships at Brighton Technical School. Boys. - Brighton Technical School Old Boys’ Scholarship : Walter M. Maxwell. The White Scholarship, (donated by Wing Commander T. W. White) : Rodney G. Speckman. School Council Scholarship : James F. Parsons. Intermediate Technical Scholarships : Allan Wright-Smith, Noel L. Svenson. Girls. - The White Scholarship : Betty Wallis. The Wales Scholarship : (donated by Mr. A. W. Wales), Marie Machin. School Council Scholarship : Sheila Williams. Intermediate Technical Scholarship : Beryl Finlayson. Entrance Scholarships : Brighton City Council Scholarships : Allan Leslie Phillips, Russell Keith Lewis, Fay Billings, Joyce Knight. Moorabbin City Council Scholarships : Lorna Sullivan, Prudence Rea, Alton Baker, Keith J. Brennan. Sandringham City Council Scholarships : Patricia Cockcroft, David James Steel. ​Australasian, Saturday, 10 January, 1942. Page 29. GOOD WORK FOR THE WAR. An admirable spirit of helpfulness has characterised schools throughout Australia during the war period, and the sum total of their activities demands respect. Pupils in our schools have knitted, collected money, made camouflage nets and splints, learned first aid and Red Cross work, joined fire-fighting squads, and even made model planes for the use of the RAAF. First-aid and ARP classes are being conducted either for pupils or teachers at most schools. Brighton Technical School has made 60 ARP rattles, and the school’s staff are qualified in ARP and first aid. At Wesley College ambulance work and ARP classes are conducted, also at MLC and Scotch College. The Argus, Thursday, 12 February, 1942. Page 8. The Education Department has awarded the following senior technical scholarships, carrying with them free tuition and an allowance of £30 per annum for day courses. Holders of scholarships under clause 34 (d) of the regulation will undertake to enter the service of the Education Department on completion of their courses. Clause 34 (d) of Regulation 21. Anderson, W. R. Brighton T.S. for Swinburne T.C. ; Harding, J. F., Brighton T. S., for Swinburne T.C; Barker, E. J., Footscray T.S., for Footscray T.C. ; ………………………………. ​The Age, Saturday, 14 February, 1942. Page 4. The annual house swimming sports of Brighton Technical School were held at Middle Brighton baths yesterday. The house contest was won by Snowball, 38 pts., from Grout 26, Wilson 23, Richards 12. McLaren (S.), 1; Baxter (G.), 2; Purves (G.), 3. Under 15 : Packham (W.). Under 14 : Keane (G.). Under 13 : Tresize (S.). Under 12 : Steele (S.). Backstroke. – Open : McLaren (S.). Under 14 : McLaren (S.). Breast Stroke. – Open : Purves (G.). Under 14 : Barr (S.). Diving. – 14 – 16 : McLaren. (S.). Under 14 : Wessell (R.). ​The Argus, Wednesday, 4 March, 1942. Page 8. Unsatisfactory conditions of many public trenches were referred to at Brighton Council meeting on Monday by Cr. D. J. Granter. Those in Hurlingham Park were still three-quarters full of water 11 days after the last rain, and at the technical school the water was about 2ft. deep and was very green and slimy. Cr. Treacy strongly supported the complaint. It was resolved to refer the matter to the patriotic committee for investigation. ​The Age, Friday, 22 April, 1942. Page 3. Stoker J. H. Hill, 23, (killed on H.M.A.S. Vampire), was born at Rotherham, Yorkshire, England. He was educated at Elwood State and Brighton Technical Schools. He joined the Royal Australian Navy on April 1, 1941, and was formerly attached to the 22nd. Baty., 15th. Field Brigade R.A.A. He was the only son of Mr. and Mrs. Hill, Union-street, Kyabram. He married Miss Eunice Faull, daughter of Mrs. C. Faull, Lincoln-square, Carlton. The Age, Wednesday, 26 August, 1942. Page 2. Nearly 2,000 senior cadets from city and country public schools, high schools and technical schools will go into camp this week. Quarters have been prepared for them at a military training camp “somewhere in Victoria.” where, though their own camp will be a completely self-contained entity, the boys will have an opportunity of seeing something of the training and manoeuvres of the troops. The advance contingent of the cadets will leave for camp to-day. This party will include 128 boys from Geelong College, and a group of 30 selected personnel. On Friday the main party will travel to the camp by two special trains. This contingent will number over 1,760 boys, and the first train will be filled by cadet corps from Melbourne Grammar, Scotch College and Trinity Grammar. Cadets from Wesley, Caulfield and Brighton Grammar Schools, Caulfield and Brighton Technical schools, the University High School and Carey Grammar will travel by the second train, and will be joined by a small country contingent from Ballarat, Bendigo, Albury and Hamilton. ​The Argus, Thursday, 3 September, 1942. Page 3. Posters and slogans to be exhibited in Melbourne soon to assist the National War Loans and War Savings Campaign are being designed by students at 31 Victorian technical schools. Average age of the students is between 14 and 17, but they reveal a remarkably high standard. Mr. Curtin, Prime Minister; Gen. MacArthur; and Gen Sir Thomas Blamey have given permission for their portraits to be embodied in special messages. Committee in charge of the exhibition comprises : Mr. W. A. Dean, acting Chief Inspector of Technical Schools (chairman); Mr. H. Jolly, assistant art inspector, Education Department; Mr. H. R. Brown, principal of art school, Melbourne Technical School; Mr. S. W. Tompkins, principal of the art school, Swinburne Technical School; Mr. T. Bernaldo, head master, Brighton Technical School; Mr. J. Winkleman, head master, Caulfield Technical School; and Mr. A. Henry, War Savings and War Loans Committee representative. The Argus, Friday, 11 December, 1942. Page 2. In a report by the principal of Brighton Technical School it is stated that the school cadet corps now has a strength of 100 officers and cadets, most of whom took part in the cadet parade in the city on Saturday. The corps, which was established in 1939, is supported by Brighton and Moorabbin city councils. ​The Argus, Friday, 27 August, 1943. Page 3. SCHOOL CADETS’ CAMP BEGINS TODAY. Aged from 14 to 17 years, 2,500 public school cadets will go “under canvas” today, the first day of the second term holidays, at a cadet camp “somewhere in Victoria”. The boys, who are Wesley College, MGS, Geelong College, Caulfield, Brighton Carey, Trinity and Camberwell Grammars, Haileybury College, University High School, Caulfield and Brighton Technical Schools, Mentone Grammar, De La Salle, St. Bernard’s, St. Patrick’s College, Albury Grammar, Hamilton College, Ballarat College, Bendigo High School, and Gordon Technical Institute, Geelong, will be under routine orders from 6.30 a.m. to 9.45 p.m., and will be subject to strict army discipline. The camp is under the command of Maj. R. M. Lemmon, who will be assisted by Lieut. T. F. Stott, and besides doing practical field work in artillery, signalling, and with Vickers guns and mortars, the cadets will also attend lectures on jungle and commando warfare given by members of the AIF. ​The Age, Saturday, 23 October, 1943. Page 2. After inspecting Brighton technical school yesterday afternoon, the Minister of Education, (Mr. Hollway), gave an assurance that he would seriously consider the provision of increased facilities for the accommodation and training of students there. At present the daily attendance at the school, according to the principal, (Mr. I. Topperwien), is about 800, and many applications from youths eager to enrol have had to be rejected. The congestion is so acute that four new classrooms are urgently needed, also a large engineering shop. Some time ago the former Minister of Education, (Mr. Lind), promised that something would be done to relieve the position, but expectations in this direction have not been realised. Later, Mr. Hollway, accompanied by Mr. Macfarlan, M.L.A., inspected the site for the new technical school at Sandringham. He expressed the opinion that it was admirably situated to serve the needs of Sandringham, Moorabbin and other adjoining districts. Sea Spray The Magazine of the Brighton Technical School. December, 1943. Page 10. BTS SOCIAL EFFORTS – PATRIOTIC. This year the girls have been very busy making camouflage nets, and up to October we have completed seventy-eight nets, but before the year is up we hope to reach the total of one hundred and thirteen. We have our working bee on Thursday afternoons at 1 o’clock, and continue working till half past two, with an attendance of sixteen senior girls, and do we work. Nona Allan has been very industrious helping to rope the nets with Miss Woolnough, the netting instructor, and her help has been greatly appreciated, I’m sure. ​Sea Spray The Magazine of the Brighton Technical School. December, 1943. Page 10.
amount totals 16/- they receive a War Savings Certificate. Certificates are purchased each week, and thus, often when a girl completes her 16/-, she gets the benefit of a couple of month’s interest. Pocket money may be supplemented in sundry ways. One good idea is to clean mother’s cupboard, and perhaps that will earn 6d. or 1/- . To sell newspapers is a good plan. Every tradesman is calling out for newspapers. Even if a basketful is taken every time quite a sum of money accumulates. If out on an errand for your mother, why not ask the next-door neighbour if she has any commissions to be done at the same time. Money can be easily raised like this. Up to date, twenty-five War Savings Certificates have been purchased; most of the girls have one Certificate; some have two, and all are trying to complete another by the end of the year. The annual church parade was held this year in April at the Baptist Church, Bay Street, on the invitation of the Minister, Rev. Smith. The preacher, a padre who recently returned from the Middle East, and who was a soldier of the last war, gave a particularly interesting and appealing address to the cadets, who derived from it great benefit. Also present in the church were the Principal, (Mr. I. Topperwien), the President of the School Council, (Mr. W. Jack), and Mr. and Mrs. J. Entwisle. Mr. Jack later commended the boys on their soldierly display. Our thanks are due to the Rev. Smith for his invitation to participate in the service. HOUSE POINTS (UP TO OCTOBER, 1ST.). Sea Spray The Magazine of the Brighton Technical School. December, 1943. DUX OF FIRST YER : Albert Mitchell. DUX OF SECOND YEAR : Ian Eustace. DUX OF THIRD YEAR : Allan Wright-Smith. OLD BOYS’ ASSOCIATION : James Parsons. ​SCHOOL COUNCIL : Albert Mitchell. EDUCATION DEPARTMENT : Richard Odgers. CR. W. J. ORR TO FORM 2. (English and Social Studies : Arthur Roberts. CR. W. J. ORR TO FORM 1. (English and Social Studies : Leonard Dudley. (General Progress) : Jack Rodgers. (General Progress) : Frank Hollis. Engineering Class, Grade 2 : E. R. Stock. Joinery Class : R. Paul. City of Brighton. 1. D. Ross (one year). 2. E. Gray (one year). City of Sandringham. 1. D. Steel (two years). 2. A. Krause (three years). City of Moorabbin. 1. M. Collins (one year). 2. M. Edmunds (one year). ​The Age, Wednesday, 27 December, 1944. Page 4. The increasing demand for admission to technical schools, stated the principal of the Brighton technical school, (Mr. I. Topperwien), in his annual report, was an indication of the growth of public interest in that branch of the State education system. Apart altogether from the value of technical training as a preparation for a skilled trade or profession, educationists and the public generally had come to recognise the value of such training as a preparation for life in the fullest sense. Schools which had followed the classical tradition for generations had introduced into their curriculum such subjects as carpentry and black-smithing. In an age of mass production, pupils who had the opportunity of taking practical subjects learnt something of the joy of creation which animated the skilled craftsman of the middle ages, and had its flowering in the magnificent buildings of that period. On the other hand, there has been a trend in technical education towards the wider and more truly cultural education. It was no longer sufficient to train pupils to be skilled craftsmen, though that in itself might be regarded as a worthy aim. They had to be trained to take their places as good citizens in a society which was growing increasingly complex. Scholarships donated by Brighton Technical School Council. - Dux of First Year : Linda Baker. Dux of Second Year : Valda Eileen Randall. Prizes donated by Mrs. W. Jack – Proxime Accessit – First year : Joy Jacobsen. Second year : Margaret Corrie. Third Year : Barbara Bennett, Head Prefect : Joan Clark. Prize donated by Messrs. R. Breen, J. Entwisle and R. Hayball. – Dux of Third Year : Patricia Cockcroft. Recommended for Intermediate Technical Scholarships, donated by the Education Department : Valda Eileen Randall, Margaret Joyce Corrie. Municipal Scholarships. – Brighton : Gwen King, 1; Jean Phillips, 2. Moorabbin : Barbara Marten, 1; Joan Turnbull, 2. Sandringham : Mavis Fellowes. Special Prize donated by Mr. W. Nash. - First in Commercial Class : Sheila Williams. Second in Commercial Class : Kathleen Macro. Outstanding Achievement in Sport. Non-swimmer to Holding Bronze Medallion in Less Than 12 Months : Linda Baker. Scholarships donated by the Brighton Technical School Council. - Dux of First Year : Peter Harris. Proxime Accessit : Douglas Stobart. Dux of Second Year : Robert Hooppell. Proxime Accessit : Desmond Parker. Scholarship donated by Brighton Technical School Old Boys’ Association (third place in the second year boys) : Keith Frost. Scholarship donated by Mr. W. Keys, (to be known as L. Steminger Scholarship) - First Year : James Simmons. Second Year : Robert Hooppell. Prize donated by Messrs. Robertson and Mullens : Lance Wilson. Prize donated by Mr. H. K. T. Chancellor : N. Hillier. Prizes donated by Mr. W. H. Nash – Dux of Third Year : Donald Todd. Proxime Accessit of Third Year : Geoffrey Clifford. ​Sea Spray The Magazine of the Brighton Technical School. December, 1945. Page 2. PRINCIPAL : I. TOPPERWIEN, M.A., B.SC. With the cessation of hostilities in the Pacific, Australia is faced with the tremendous task of repatriating thousands of men from Europe and the Pacific regions, and establishing them once again in civil occupations. In order to complete this task successfully, the energies of both Federal and State governments will be, for the next five or six years, concentrated on the work of training and equipping our returned men to take their place once again in the everyday life of the Commonwealth. Meanwhile the work of training boys and girls in our Technical Schools must go on, and it behoves every pupil in these schools to make the fullest use of his or her opportunity. The process of changing over from a war time to a peace time economy may well be a painful one, bringing in its train disillusionment and discontent. In the next few years the untrained, unqualified applicant for employment may realize too late that he has missed his golden opportunity and may find himself compelled to accept uncongenial employment. Boys and girls entering technical schools should decide on their goal, and should not be deflected from their course by the many distractions of the world. Apart from the selfish aim of securing for themselves congenial employment, pupils must remember that they will be going out into a world distracted by the multitude of problems that have come with the end of the war. False prophets will undoubtedly appear with facile solutions, offering ease and comfort without hard work. Unless the young men and women of that time have developed their critical faculties, and learnt to think and judge for themselves, they will find themselves blindly following every new Pied Piper who has some strange new creed to preach. The salvation of this country will be found, not in new ideologies, but rather in the industry and enterprise of young people, able to think for themselves, and willing to work hard to achieve their aims. Sea Spray The Magazine of the Brighton Technical School. December, 1945. Page 3. I think you will all agree the passing year has been a most eventful and memorable one and we have every reason to rejoice and be thankful that we have been spared the dreadful ordeal suffered by so many millions in other countries not so fortunately placed as ourselves. To those of you who have lost a dear one or have suffered in any way through the terrible ravages of war, I extend my sincerest sympathy. To those more fortunate and who are waiting to greet their loved ones returning from a lengthy absence, I trust it will not be long now before you are re-united and that much happiness will result. To the younger scholars and those of you who are on the threshold of your career, I look back with very mixed feelings to think we are, on the one hand, striving to fit and assist you to take your respective places in the community as honourable, upright, God-fearing citizens living a life that aims at reaching the ideal, and at the same time have brought you to this world of chaos and strife. However, as young Australians and members of a great Commonwealth of Nations, you have much to be thankful for and it is my sincere wish to you all that the future will be brighter and happier and in every way better, and that such events of the past six years will never occur again then we may say that the terrible sacrifices already made have not been in vain. ​Sea Spray The Magazine of the Brighton Technical School. December, 1945. Page 7. On the morning of October 29th., everyone was shocked to learn of the sudden death of one of the School’s outstanding students, Albert King, at the age of 15 years. Albert was enrolled at the beginning of 1943, and during the past 2 ½ years he has built a proud record that will stand as an inspiration to students for many years to come. An outstanding athlete, he was Junior champion in 1944, and under 16 Champion in 1945, and also participated in the activities of the Sandringham Amateur Athletic Club. As a member of the School baseball team he was very successful as a catcher and wielded a strong, vigorous bat. During the latter half of the season he played with Elsternwick Baseball Club and showed very definite promise. Albert was also a member of the School cricket team during 1944 – 45, his best score this season being 67 n.o. He was a very keen fieldsman and aggressive with the bat. But, it was not in sport alone that Albert King showed qualities of leadership. His house-mates did him the high honour of electing him House Captain, and his classmates appointed him Vice-captain of his section – tributes to his popularity and manly bearing. Albert brought to his studies that determined application which made him so outstanding at sport, and his scholastic record is one of steady improvement from the time he entered the School until he won first place in his class at the mid-year examinations this year. The ways of providence are unpredictable, but the world can ill afford to lose such as he. The deepest sympathy of the Principal, Staff and Pupils of the School is extended to his sorrowing relatives. Sea Spray The Magazine of the Brighton Technical School. ​Spacious lawns and attractive gardens surround the fine old building, at one time called “Cora Lynn”, to which have been added modern classrooms and every convenience which a modern school demands. At the rear of the school are two tennis courts for use at any time, and three basket-ball courts. Sports material available for use by pupils include basket-balls, hockey sticks, spikes and tennis-racquet racks. The kitchen is provided with a refrigerator and electric and gas stoves. It is a large, well planned room with ample equipment for a class of twenty girls. In concluding, I am sure my fellow scholars will agree with me when I say that here is a school at which one may enjoy one’s education. ​The Age Tuesday, 1 January, 1946. Page 2. The school president (Mr. W. Nash), speaks, too, of the problems facing those on the threshold of careers. He refers to his very mixed feelings in striving to fit and assist students to take their place in the community as honourable and upright citizens, while at the same time the students had been brought to a world of chaos and strife. Dux prizes were : - First year, P. Harris; second year, R. Hooppell; third year, D. Todd. ​Sea Spray The Magazine of the Brighton Technical School. December, 1946. Page 2. 1946 is a notable year. To all Australians it means the first year of peace after six years of cruel, destructive, wasteful war. To thousands returned from a Homeric contest, it is a year of relief and happy re-union. To citizens in every Australian community it brings the hope of a brighter future. To the Brighton community in particular, it heralds the time to plan boldly for the second quarter of a century in the life of Brighton Technical School. Since I came here eleven years ago, I have felt that our School, because of its location in the centre of neighbourhoods that are either closely settled or newly-developed, can help to turn Brighton into a real community – a city in which a full life can be led, not only by its boys and girls, but by its youth and adult men and women. So it is that I look ahead to the future, to the realization of the vision that came thirty-four years ago to those who decided to work for the establishing of a Technical School in this district. Much of what was described as the ideal at the New Education Fellowship Conferences of 1938 and 1946 must in this atomic age be regarded as vital necessities – buildings architecturally beautiful, equipment modern and adequate, furnishings exquisitely designed, staffs justly rewarded, and amenities provided as the rightful due of whose who seek refinement and culture as well as skill. I envisage the present drab surroundings replaced by a setting possessing dignity and charm. I see students, young and old, thronging hither day and night to enjoy a full range of technical, cultural and even social activities. Finally – and this perhaps will be most important of all – I see a community that at last resembles a live democracy, with citizens no longer ignorant of and indifferent to their community’s needs, but interested in their schools, active in local affairs, and linked by common interests and a common purpose. I shall feel that, with a sense of community so strongly revived, Brighton will have compounded the best antidote to a totalitarianism which came so near to destroying that state of society which alone can make life worth living for the common man. ​Sea Spray The Magazine of the Brighton Technical School. December, 1946. Our share of the effort for the Children’s Hospital Appeal resulted in £97/8/8 being raised. The effort was very general, and every boy in the school has the satisfaction of knowing that he played his part. The champion collector was Roy Loffel, who raised £5/8/- and for this splendid effort he was awarded an Honour Certificate. For the “Save the Children Appeal” time was limited, but even so the boys raised £45, and again every student played his part. Sincere thanks is expressed to one and all who helped to make our social service efforts such a success. Sea Spray The Magazine of the Brighton Technical School. December, 1946. ​ ROYAL LIFE SAVING AWARDS. First and Second class and Bar to Bronze Medallion. ​Sea Spray The Magazine of the Brighton Technical School. December, 1946. Page 41. (As known at October 15th. 1946). ​The Argus, Saturday, 20 December, 1947. Page 38. Australian children were the “best-off kiddies in the world,” Lady Dixon told children of the Melbourne Orphanage, Middle Brighton, at their annual distribution of prizes yesterday afternoon. They were fortunate, she said, to be living in a land belonging to the British Empire, which upheld the same principles as the children were taught at school. Australia was depending on its youth to assume the responsibilities of citizenship and lead the nation to a more realistic love of democracy and the British way of life. Outstanding pupil was Alister Sherrington, 16, who won the gymnastics, boot-repairing, and scripture prizes. He also won a scholarship at Brighton Technical School. ​Sea Spray The Magazine of the Brighton Technical School. December, 1947. Page 2. ​In this – our Silver Jubilee Edition of “Sea Spray,” it behoves us to record with pride the history of the foundation and the development of our school – The Brighton Technical School. It was in July, 1912, that the first attempts were made to provide facilities for technical education in the Brighton district. As a result of this movement a “Technical Education Committee,” which was elected at a public meeting, approached the Brighton Council with the request that the Library building in Bay Street be transferred to the Education Department for the purpose of technical education. The cause was actively championed by the energetic support of the Hon. O. R. Snowball, M.L.A., and the Hon. W. A. Adamson, M.L.C., in the ensuing years. However, it was not until 1917 that the Town Council agreed to transfer some land in Berwick Street and also the Library building to the Victorian Government for the erection of a Technical education institution. Events then began to move apace as the first school council was formed in 1918. The far sighted gentleman of this newly formed council seeing the futility of transferring the Library building to the Berwick Street site offered to raise the sum of £1,500 which was to be handed over to the Government on the completion of the erection of a suitable building for technical education on the Berwick Street site towards which the Government promised to contribute £5,000. In 1920 the building was under construction, and in the following year another significant forward step was undertaken with the purchase of the adjoining site “Cora Lynn” – the situation of the girls’ school. Mr. C. Fraser, B.Sc., was then appointed as the first Principal of the school, his first lieutenant – Mr. A. J. Dunlop being appointed a year later (1922) as the headmaster of the boys’ junior day school. Steady progress was maintained in the development of the boys’ school and in 1923 the girls’ school was opened under the leadership of Miss Aubrey who was followed in a few months by Miss Nash. The years 1927 and 1928 saw the death of the Headmaster (Mr. Dunlop) and the President and Vice President of the School Council. That the sterling work performed by these office-bearers of the council was sincerely appreciated is evident in the moving tribute paid to them and set on record by their fellow members of the council - “The Council of the Brighton Technical School places on record the profound loss sustained by this institution in the deaths of its President and Vice-President, the Hon. O. R. Snowball and Cr. J. B. Grout. The council records its conviction that the proud and prominent position occupied by this school is in a very great measure due to their wonderful vision, their tireless energy, and the supreme faith of these two leaders. In 1928, Miss Swan took over the direction of the girls’ school, a position which she occupied with signal efficiency and success until the end of 1945 when she transferred to the Box Hill Girls’ Technical School as Principal, and her place at Brighton being filled by Miss Beaven. After Mr. Fraser had served as Principal for eleven years the school was saddened by his death in 1932. Mr. Percy Everett then became Principal, but three years later he took up new duties as chief Architect for Victoria, and our present Principal – Mr. I. Topperwien, M.A., B.Sc., became the third man to control the destinies of the school. In the following year, Mr. R. G. Perry, B.Sc., was appointed as Vice Principal, a position which he had held in an acting capacity for some years. Last year Mr. Perry was transferred to the Inspectorial branch of the Victorian Education Department, and his duties are now entrusted to the capable Mr. A. Lawson. Since Mr. Topperwien has taken over the reins he has seen many changes, The 1939-45 war saw the school contributing to the war effort by co-operating in the commonwealth scheme for training technicians for work in munitions. Now that the war is over the school is doing its share to promote the rehabilitation and advancement of returned servicemen. 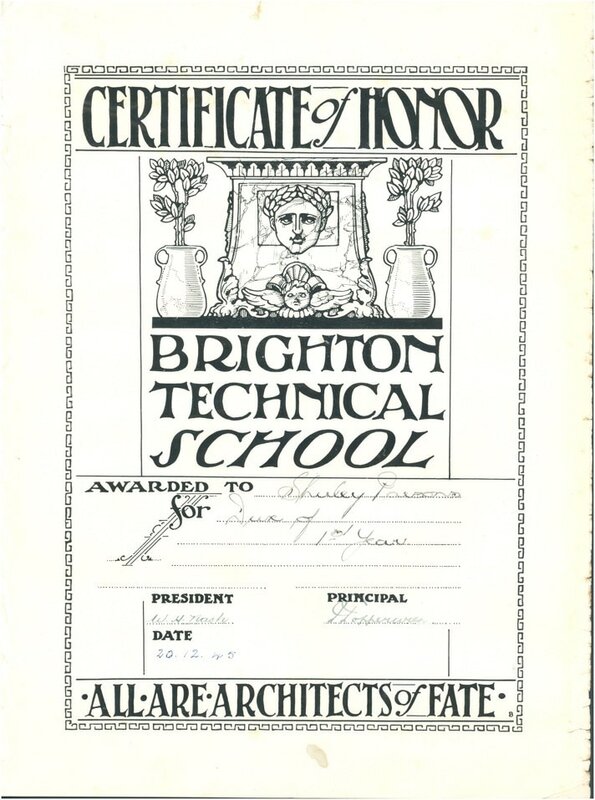 Brighton Technical School is now a large institution with an enrolment in excess of 1,700. Many a fledgling apprentice who entered its portals has emerged as a skilled tradesman ready to take his place in this modern world. ​Sea Spray The Magazine of the Brighton Technical School. December, 1947. Page 9. LISTS OF SCHOLARSHIPS AND PRIZES. DUX OF 1ST. YEAR : Frances Andrews. DUX OF 2ND. YEAR : Shirley Parsons. DUX OF 3RD. YEAR : Linda Baker. DUX OF COMMERCIAL : Valda Randall. DIX OF 1ST. YEAR : Frank W. Unsworth. DUX OF 2ND. YEAR : Donald J. Dettman. DUX OF 3RD. YEAR : Geoffrey R. Coulson. DUX OF 4TH. YEAR : Keith McKenzie. Girls : Nell Tehan, 1; Ellen J. Cook, 2. Moorabbin - Boys : Ian F. Beaumont, 1; James Wilson, 2. Girls : Judith Shinkfield, 1; Audrey C. Luttke, 2. Sandringham - Boys : Brian Bodsworth, 1. Girls : Betty E. Olney, 2. ​Sea Spray The Magazine of the Brighton Technical School. December, 1947. ​This year the girls are very keen readers, school girls’ and mystery stories being in constant demand. The “Anne” series and “Billabong” books are most popular. We were very fortunate, as early in the year Miss Bowden was able to get about 40 good books for us, including “Heidi Grows Up,” “Rainbow Valley” and three “Billabong” books. As you know, books are still very dear and hard to get, and are not up to the pre-war standard. We wish to thank Miss Bowden for her help and co-operation throughout the year. There has been a great drain on air and adventure books this year, the first year boys being the main customers. “Biggles” books were the most popular, as they have been in other years. They have hardly been in the Library more than a day at a time. The Library Monitors did a very good job this year, and there was hardly a complaint about the service. In the earlier part of the year before regular librarians had been appointed, there was a very small number of books out, but as soon as the “regulars” were appointed there was an improvement. We would like to thank Mr. Hamley for his help and guidance. Sea Spray The Magazine of the Brighton Technical School. December, 1948. Page 2. ​In this materialistic world there is a tendency to consider the aim of education too much from the utilitarian angle. Both parents and scholars look on the three stages of schooling as a means to an end – the earning of a living in a highly competitive society. Education, however, should not be restricted to this narrow aim; it must equip a child for complete living, so enabling him to use and enjoy his leisure to the full. Hence, to parents and others who question the value of aesthetic subjects in a Technical School curriculum, I reply that by developing the fine arts, encouraging musical appreciation, and duties of citizenship, fostering debating groups and extending library services our technical schools can help change the materialistic trend of modern education. the ability to make a showy parade of concrete possessions, and where altruism is fast becoming old-fashioned. A cynical community tends to regard effort as justifiable only if it yields a monetary return, but a wiser society remembers that the interests of all its members are inseparable, and that he who may be placed on the lowest spoke of Fortune’s wheel is the concern of all his fellows. Sea Spray The Magazine of the Brighton Technical School. December, 1948. Page 6. J. G. Simmons and D. J. Watkins. (Free tuition and £30 per year for one year). P. J. Hoxley, J. C. Izon, L. R. Boyd and J. F. Guinane. (Free tuition and £ 10 per year for five years). Trade Course : Free tuition and £5 per year for three years. M. Kerr and R. Cramond. Brighton : D. Horman, K. Bull, E. Unmack, V. Brockhurst. Moorabbin : J. Gatford, P. Michael, J. Malin, J. Ashley and J. Collier (equal). Sandringham : R. Frith, D. Eyles. ​Sea Spray The Magazine of the Brighton Technical School. December, 1948. Page 34. On 15 September, Mr. Murray used the school amplifying system to address both the Boys’ School and the Girls’ School in an appeal for eggs for the Royal Melbourne Hospital. Interesting facts gleaned were : R.M.H. has room for 460 patients, requiring 336 nurses. It is open to all people, irrespective of race or creed. There is no means test (What does that mean, 3EF?). Each year half a million eggs are needed. B.T.S. responded to the appeal by contributing 328 dozen eggs. (Boys 200, Girls 128 dozen). One girls’ Form, 1B, collected the largest number 32 dozen; for this commendable effort 1B received a special trophy. The Hospital authorities presented a certificate to B.T.S. in recognition of the valuable assistance given to the 1948 Appeal. Staff contributions from fortnightly pay cheques have been used to purchase 31 food parcels varying in value from 10/- to £1/2/6. Another £9 is in hand. The parcels have been a welcome surprise to teachers and retired teachers in various English counties. “Thank you very much for the lovely parcel I received. little babies can get it”. kind gift you sent me”. ​Sea Spray The Magazine of the Brighton Technical School. December, 1948. Page 35. Mr. Walter Ernest Briggs, aged 81 years, died at his home, No. 71 Union-street, East Brighton, on January 9. Brighton’s memorial is in the silky oak trees which were his idea for street ornamentation during his councillorship from 1918 to 1927, when he retired. He was Mayor of Brighton during 1925. He became a foundation member of the Brighton Technical School Council in 1925, and remained on the Council until ill-health forced him to resign, very reluctantly, three years ago. The Union Jack was flown at half-mast at the Town Hall in respect of one of Brighton’s former Mayors, a great lover of flowers and the bush, and one who gave great service in the public affairs of the city. ​The Age, Wednesday, 16 March, 1949. Page5. Many friends of Mr. and Mrs. J. H. Taylor, Brighton, who were married on March 15, 1899, called at their home yesterday to offer congratulations to them on their golden wedding anniversary. Mr. Taylor, who is president of the Brighton Technical College, was town clerk of Brighton for nearly 45 years. He retired three years ago. Mrs. T. W. White, (wife of Mr. White, M.P. ), the Minister for Education, Mr. Tovell, and Mrs. Tovell, the mayor of Brighton, Cr. J. E. Stamp, and Mrs. Stamp, the town clerk, Mr. H. C. Ferguson, the city engineer, Mr. C. E. Tuxen and Mrs. Tuxen were among those who visited Mr. and Mrs. Taylor yesterday. The Age, Saturday, 30 April, 1949. Page 2. The Minister for Education, (Mr. Tovell), found himself on the other side of the fence when he received a deputation from the Technical Schools Association of Victoria yesterday. For many years before he became Minister for Education, Mr. Tovell was a member of the council of the Brighton Technical School, vainly trying to get the department to institute the reforms which he supported. He was welcomed yesterday as Minister by the past president of the association, (Mr. W. Olver), who said how pleased the association was to see him in such a position after his years of battling for technical schools. “I can assure you, you see very differently when you are on the inside looking out,” he said. The Age, Friday, 5 August, 1949. Page 5. In honor of the 21st. birthday of her son, James, Mrs. Victor Harrison, of Taggerty, entertained about 100 friends at a dance at Wattle Park Chalet last night. Among the guests who came from Taggerty for the occasion were Mr. M. J. Gorman and Mrs. And Mrs. S. Panther. Also present were some of James’s old school friends from Brighton Technical School, and friends from Melbourne Technical College, where he is studying engineering. The Age, Tuesday, 9 August, 1949. Page 2. The visit of the Minister for Education (Mr. Tovell), to Brighton Technical School on Thursday promises to be an extra special occasion, particularly for the girls in the cookery section. When Mr. Tovell sits down to midday dinner as the guest of honor of the school council, the girls will feel they have a special interest in his welfare : now Minister, he was formerly a member of the council, and above all, he lives at Brighton. On occasions like this, the girls take pride in showing expert skill in preparing menus, decorating and waiting at table. Mr. Tovell’s visit to the technical school will be included in a tour of inspection of Brighton district schools. The Age, Friday, 12 August, 1949. Page 2. MINISTER’S WARNING ON DEAD-END JOBS. A warning of the danger to young people of ‘dead-end’ jobs was given by the Minister for Education (Mr. Tovell), yesterday to Brighton Technical school students. Mr. Tovell said the commercial world was seeking labour. It was offering most attractive salaries to girls and boys of 14 to go into ‘dead end’ jobs. “You youngsters of 14 can get a job for several pounds a week watching a machine, or doing something equally useless,” he said. Mr. Tovell said it was far better for children to stay at their school. “If you have knowledge you have all the power you want, and if you haven’t that knowledge you are just impotent. You will become ‘dead-end kids,’ and I want to warn you against that,” he said. ​He advised children to stay at school until they were thoroughly qualified, and could demand a job commensurate with their ability. Mr. Tovell was a member of the official party which inspected the school and cadet guard in the morning. Other visitors included Mr. Don. M.L.A., the Director of Education, (Mr. A. H. Ramsay), and the Chief Inspector of Technical Schools, (Mr. O. E. Nilsson).